An illustrated map of one rural foodie town. Here, in a tiny corner of northern Vermont where cattle seem to outnumber people, farms and food businesses are blossoming and garnering both national and international attention. Their secret? Collaboration. Here’s how it works. (1) Claire’s Restaurant—Two years ago, more than 100 locals bought shares to help start a “locavore” restaurant in Hardwick, recently named one of the top “up and coming” restaurants in the U.S. Down the road in Morrisville, locals loved “their” restaurant so much they chipped in to support (2) The Bee’s Knees when it needed a cash infusion. Both restaurants source most of their ingredients locally, including cornmeal and other grains from (3) Butterworks Farms, which also produces yogurt and is part of (4) Pete’s Greens CSA. Though Pete’s Greens is best known for the organic baby greens it once sold to trendy restaurants in Boston and New York, today half its business comes from its Good Eats CSA, which bundles everything—from its own greens to bread and bacon made by other local producers—and delivers it to some 250 neighboring members. When (5) High Mowing Organic Seeds, one of the country’s largest purveyors of organic seeds, had a surplus of pumpkin, it went to the Pete’s Greens kitchen to be made into pies that were given to the local food bank. 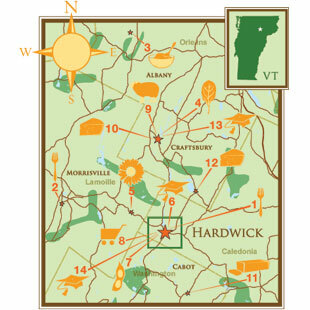 High Mowing Organic Seeds founder Tom Stearns is the president of the (6) Center for an Agricultural Economy, a not-for-profit founded by (7) Vermont Soy entrepreneur Andrew Meyer with the goal of building a sustainable community around food and agriculture. You can find the best products of the region—ranging from seeds to soy—at the (8) Buffalo Mountain Co-op, one of the oldest in the country. It’s also a good place to pick up lamb and sheep’s-milk cheeses from (9) Bonnieview Farms and other cheeses from (10) Ploughgate Creamery, (11) Cabot Creamery and (12) Jasper Hill Farm, whose 22,000-square-foot cave (said to be the finest in the U.S.) ages many of the region’s award-winning cheeses. Two agricultural-education centers complete the circle, with (13) Sterling College sending many of its students to work on farms and (14) Highfields Institute focusing on composting and providing sustainable solutions for many of the neighboring farms and businesses. So, a squash grown from High Mowing Organic seeds in the greenhouses at Pete’s Greens might be harvested by a Sterling College student and then served at Claire’s. Claire’s leftovers might be composted at Highfields Institute, then returned to fertilize High Mowing Organic Seeds’s land. For a town of 3,200, just south of the Canadian border and one of the poorest ­rural regions in America, Hardwick has become an unlikely food mecca. Named to Conde Nast Traveler’s 2009 “Hot List,” Claire’s Restaurant (see above) is an outpost of food culture there. Co-owner, lawyer and maître d’ Kristina Michelsen seats and sometimes sings for the largely local clientele, many of whom chipped in to help start the place. The food is pretty much all local, too, much of it produced within 45 miles, including the beans and greens, which come from farmer Pete Johnson of Pete’s Greens, and several world-class, award-winning cheeses, which are aged at Jasper Hill Farm’s new cave. For a copy of Kristina Michelsen's CD, Pixie Dust, visit www.cdbaby.com/cd/kristinamichelsen.